How much do you appreciate your favorite rapper? The race for wildest chain of 2018 just got a frontrunner: A piece sculpted in the likeness of what appears to be Young Thug, crafted by Shyne Jewelers for NBA YoungBoy. As Genius points out, the chain seems to have been modelled on a still from a Young Thug music video. YoungBoy soon showed off his new piece on Instagram Stories, as one does. 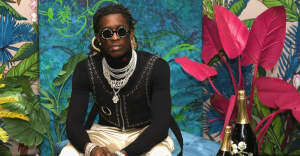 Personal 2017 chain highlights include Lil Uzi Vert's Marilyn Manson chain, Lil Yachty's Lil Yachty Chain, and the undisputed king: Quavo as the chef from Ratatouille.